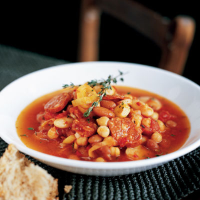 This hearty and vibrant dish uses a mix of beans, but you can choose your own favourites. Preheat the oven to 180°C, gas mark 4. Fry the chorizo in a flameproof casserole over a low heat until the oil is released. Add the leeks and fry for 2-3 minutes until they begin to soften. Stir in the chilli, garlic and sugar. Drain and rinse the beans, add them to the casserole with the passata, and pour over the stock, bring to the boil and season lightly with freshly ground black pepper. Transfer to the oven and bake for 30-35 minutes, checking occasionally to see that beans are not catching. Stir in the herbs. Serve with crusty bread, garnished with a sprig of thyme and a spoonful of Greek yogurt.